The following article ran alongside “Pizza and Beer in Milan and New Haven,” which was published in our March 2015 issue. Don’t miss these pizza and beer combos around the country. New York: Nowhere is more synonymous with pizza. If that’s your sole objective, Brooklyn’s Di Fara enjoys consensus as sliced nirvana. Most slice joints don’t serve beer, so borough up and head to Queens for Dani’s House of Pizza where the beer cooler contains shelves of options, but keep it local and get the Brooklyn Lager. Open till 4 a.m.
Boston: That deep-dish “Boston pizza” is really Greek-style pizza. For Boston beer aficionado Lee Movic, the best combo is found at the organic Flatbread Co., a company founded up in Amesbury, MA, that eschews pan-style. The Somerville outpost’s vegan flatbread, paired with Soleil D’ete, a Biere de Mars from Cambridge Brewing Co., is the feel-good/tastes-good winner. 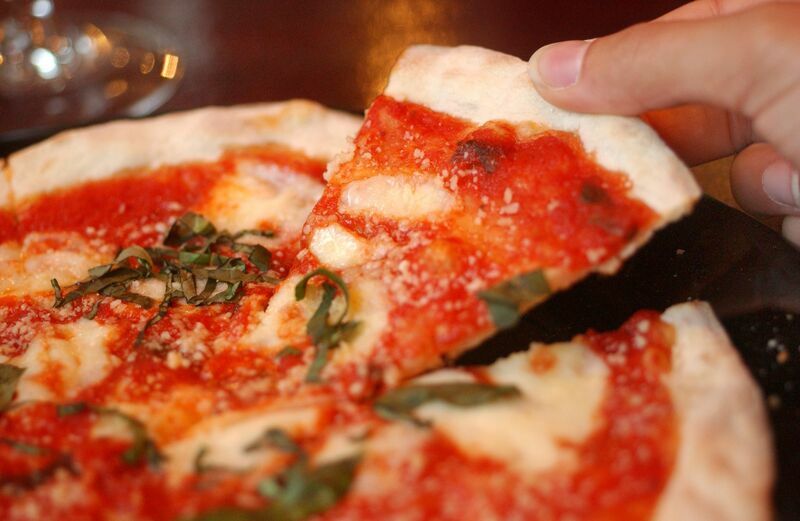 San Francisco: The city by the bay offers pizzas both cheap and gourmet, and always tasty. Pi Bar in The Mission excels at offering both. A slice of thin-crust pesto and cheese washed down with either the cult classic Russian River Pliny the Elder or the local favorite Death & Taxes, a black lager from Moonlight Brewing, is stellar, plus it’s only $3.14 for each item between opening at 3:14 and 6:28 p.m. Hood River, OR: For a quality pie, make the hour drive from Portland to gorgeous Hood River and visit Double Mountain Brewery. The heirloom tomato pie is only available seasonally, and overlaps with fresh hops season, so get Killer Green fresh hop IPA. Austin: The immensely inviting Austin Beer Garden Brewing—a not-so-weird name for a welcoming beer garden with its own brewery where bands perform in front of the fermenters for extra happy yeast—does great pies. One puts prosciutto and fried egg intermingled with kale and green garlic and goes well with award-winning Keller beer if it’s on. The Big Mama (hoppy) Red works in a pinch. Cleveland: Cleveland pizza rocks! Hit Bar Cento for a great fried egg pie. As luck would have it, Cento’s connects to Nano Brew and Market Garden, so sip on a pint of easy-drinking Market Garden Pearl Street Wheat. I’ll make a pitch for my little town of Latrobe, PA. Per capita, I think we have one of the best pizza scenes around, though you won’t find people here making a big deal out of it. Jioio’s, Gino’s, Hotel Loyal, and The Pond all have devoted followings and genuinely different styles–including a pastry crust/sweet sauce combo that I’ve never encountered anywhere else. In addition, good pies can be found at Falbo’s, Pizza Sienna, Fox’s, Scotty G’s, Carasella’s, Red’s, and all the major chains (if you prefer safety). And this is a “city” of about 8,000 people! Beerwise, the excellent Four Seasons Brewery is right outside town, and All Saints, Helltown, and Full Pint breweries are all nearby. Don’t forget Piece in Chicago, home of incredible New Haven style pizza and fresh brewed beer. Bonus: it’s co-owned by Rick Nielsen of Cheap Trick! No pizza and beer locales to be found ANYWHERE here in Chicago?! Really? I think I have a new mission in life.